Woodhaven and Cross Bay Boulevards extend north-south across Queens, between Queens Boulevard and the Rockaway Peninsula. The roadways are wide, with up to five travel lanes in each direction at certain points. The corridor carries heavy volumes of general traffic, along with over 30,000 bus riders per day riding on multiple local, Limited-Stop, and Express routes. The high speeds and traffic volumes on the corridor create safety issues that affect all users. The New York City Department of Transportation (DOT) has been studying Woodhaven Boulevard and making improvements for several years, and is now working with MTA Bus to implement Select Bus Service on the corridor. 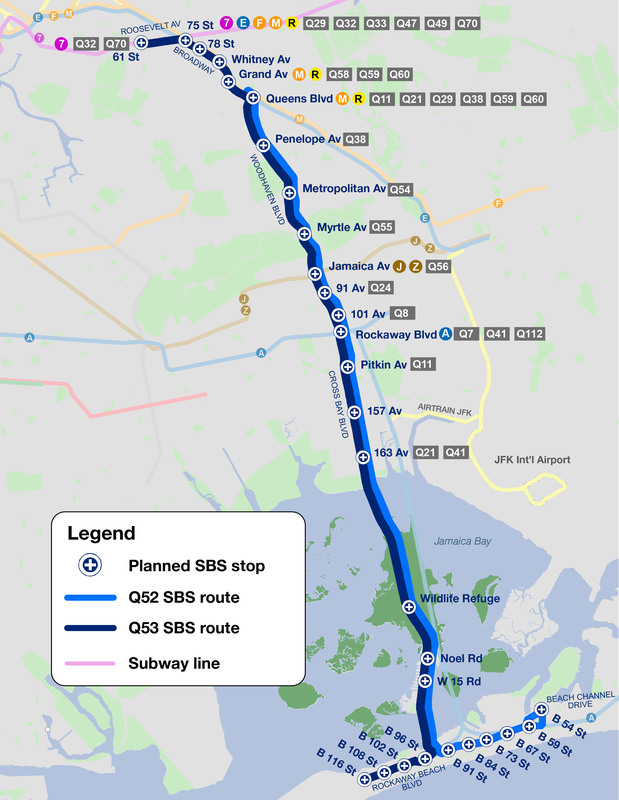 The Woodhaven/Cross Bay Boulevards corridor was identified as a preferred location for Select Bus Service improvements through the DOT/MTA 2009 Bus Rapid Transit Phase II Study, with extensive input from communities throughout Queens. The corridor is served by several local, limited, and express bus routes carrying over 30,000 people per day. Many travelers use these routes to connect to intersecting subway services in addition to going directly to businesses and schools along the corridor; however, the bus service is not as effective as it could be, as buses can be caught in congestion and the layout of the street makes bus stops difficult to reach for neighborhood residents. The goal of the project is to implement Select Bus Service improvements that make existing bus service substantially faster and more reliable, while maintaining needed traffic flow and parking, and also making the corridor safer for all users. A combination of bus lanes, signal optimization, and transit signal priority can reduce bus travel times and greatly reduce the variability that congestion imposes on bus service. These measures will also improve schedule reliability and thereby improving overall transit quality. Woodhaven and Cross Bay Boulevards have a total of three to five travel lanes plus a parking lane in each direction, with more than 150 feet of public right of way in some locations. This width provides the opportunity to implement substantial enhancements to bus service through design that has yet to be used elsewhere in New York City. The study will focus on converting the existing Limited-Stop Q52/53 bus routes to Select Bus Service. These routes extend from Rockaway Park and Arverne in the Rockaways to Woodside and Rego Park in central Queens. Therefore the study area and potential improvements will include not just Woodhaven and Cross Bay Boulevards, but also streets to the north and south including Broadway, Roosevelt Avenue, and Rockaway Beach Boulevard. In 2008, the New York City Department of Transportation began the Woodhaven Boulevard Congested Corridors Study to identify and evaluate short- and long-term improvements to help reduce congestion, improve mobility, and reduce vehicular emissions. The study examined the 3.2 mile stretch of Woodhaven Boulevard from Queens Boulevard in the north to Liberty Avenue/Rockaway Boulevard in the south. The study found that Woodhaven Boulevard is one of the most dangerous corridors in the city for drivers and pedestrians, with high traffic speeds, long crossing distances for pedestrians, heavy congestion at bottlenecks, and medians that make turns difficult for through traffic. In addition, the study found slow bus service in need of improvement. The Congested Corridors study led to many short-term improvements which were implemented in 2011 through 2014, with additional improvements planned for 2015. Long-term recommendations include roadway capital improvements and the implementation of Select Bus Service. Short-term bus improvements will be implemented in 2015 and will include offset bus lanes between Eliot Avenue and Metropolitan Avenue in the northern portion of the corridor, and curbside bus lanes going northbound approaching Liberty Avenue and southbound approaching Rockaway Avenue. Download the What’s Happening Here flyer for July 2015 work. Community involvement is a central part of the planning for this project. DOT and MTA will be regularly consulting the Community Advisory Committee, holding public forums, and directly reaching out to neighborhood and key stakeholders along the corridor. The Fall 2018 Progress Report is an early evaluation of the Woodhaven/Cross Bay SBS project a year after implementation. The report shows a 5-8% increase in ridership, 9-10% improvement in bus travel times, ~1% change in general traffic corridor travel times, and a 6% reduction in crashes resulting in injuries. DOT and MTA have convened a Community Advisory Committee to provide guidance for the Woodhaven/Cross Bay Boulevards Select Bus Service project. The committee will meet throughout the project’s planning phase and is comprised of a broad range of stakeholders, including elected officials, Community Boards, community groups, and major area institutions. Public workshops and open houses provide an opportunity for neighborhood stakeholders, residents, and bus riders to engage with one another and the project staff to develop plans for the corridor that best suit the needs of the community. 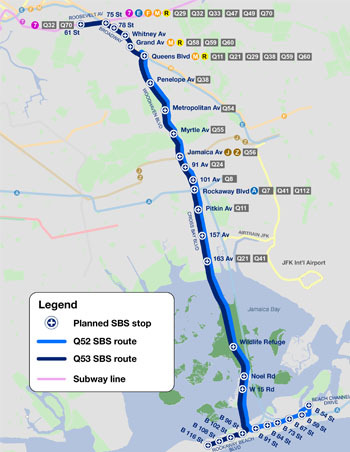 DOT and MTA will host public workshops and open houses and work with the community to develop plans for bus stop locations, SBS features, and design of the corridor. On May 17, 21, and 25, DOT and the MTA hosted public Open House meetings to share a project update on the Woodhaven and Cross Bay Boulevards Q52/53 SBS Project, with updated block-by-block street designs reflecting community feedback. The same information was presented at each meeting.